Arosha is an express slimming programme and a personalized treatment which allows obtaining in a short-time and with no efforts or side effects the desired body shape by reducing the excess centimeters and improving the cellulite conditions. What can Arosha do for you? What are the skin problems that Arosha treats? Which areas can we treat with Arosha? Enveloped by a pleasant and comfortable body wrap, the skin progressively absorbs the main active ingredients contained in the products and in just 30 minutes the results are visible: more compact and nourished skin but especially an effective reduction of excess centimeters after the first treatment. 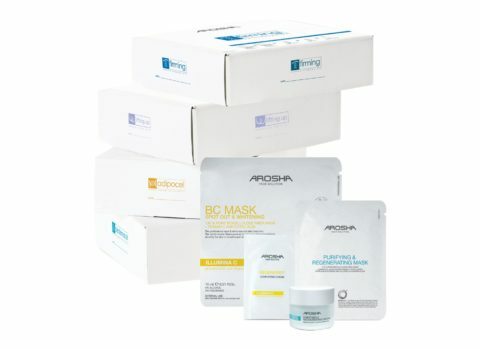 Besides an immediate and visible loss of centimeters, thanks to its innovative and efficient formula, Arosha express slimming programme guarantees you an optimal and effective solution against the skin flaws associated with cellulite, orange peel skin, water retention, loss of tone and elasticity. 8 sessions is the ideal number of treatments in order to maximize the benefits and improve skin imperfections. It is recommended to repeat the treatment every 2 months for long-lasting results.